It's that time again where we're gearing up for some Kara Goucher action on the racing scene. Yes, we're still floored from Kara's win at the Rock 'n' Roll Half on our home turf a few weeks ago, perhaps because we don't want all this Kara hype to disappear if she does take that well deserved break to start a family. But before that happens, Kara's toeing the line at the World Championships in Berlin, hoping to speed past the competition in the marathon and finally get that sought-after victory that has eluded her at her other races in New York City and Boston. I know I'll be tuning in--although I have yet to figure out how that'll happen--to cheer for Kara once again. And to check out what she'll be sporting on race day. In the two-plus-hour event, what else besides clothing and shoes are you going to look at after you've already sized up the competition, spotted the racers you want to watch, and wished you could have abs and legs that are that ripped? Or at least that keeps me entertained after I whisk the "if only I could run like that" thoughts out of my head. So what's Kara going to be sporting during the 26.2 miles? The jury is still out on some of the goods, but we were lucky enough to find out some details on her footwear. And I'm willing to bet some of her old favorites, or styles at least, will make their way out of her closet. Here's how to score an outfit nearly as awesome as Kara's, available at a Niketown near you or online at nike.com. 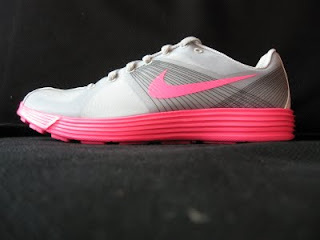 Lunaracers--These lightweight speedsters combine the racing flat weight with training shoe cushioning. While Kara will be running a pair specially designed with a hot pink bottom, you can score these with a neon yellow bottom. Race Day Airborne Top--Kara sports this top at many of her races, just peruse some pictures from the year and you'll see it in pink, white and green. The question is what color will she wear on Sunday, August 23? For a similar item, you can also sport the Distance Airborne top, available in the same shade of green as the top Kara wore at Rock 'n' Roll Chicago. Race Day Brief--Kara wears these on her bottoms at every race, and according to what Liz reported on Kara's Boston outfit, these are Kara-specific. But that doesn't mean you can't wear short shorts too. Find a slightly longer version in the Race Day Boy Brief--black, short and tight.